Located just north of Charlotte on the South East portion of Lake Norman and the Catawba River, is the lovely town of Huntersville. A simple straight shot 11 miles up Interstate 77 from uptown Charlotte between exit 18 and 25, Huntersville is an American suburbia stuck between the big city life of Charlotte and the lake life in Cornelius. It is the best of both worlds. This town has easy access to I-77, I-85 and I-485, is an incredibly convenient place to live and work. 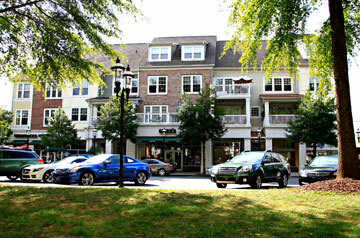 Huntersville is the place to go for shopping and dining. The town offers indoor, outdoor, and auto malls, food courts, food plaza’s, chain restaurants, family restaurants, quaint restaurants, boutique restaurants, fine dining, and casual dining. It is all here, in Huntersville.